Formed in 2002 Piva have firmly established themselves as a leading early music ensemble. Playing throughout the UK and across Europe, the group has gained a reputation for their lively performances and entertaining shows. 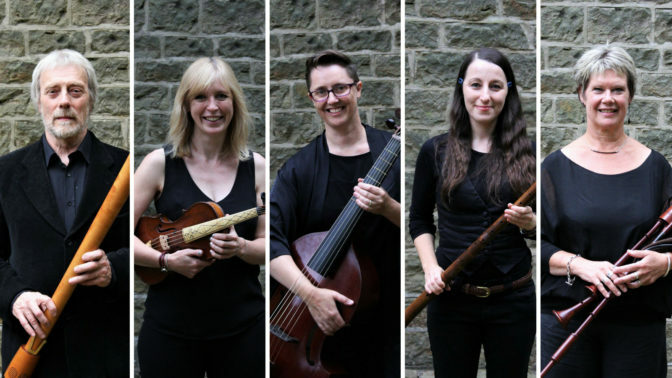 Bagpipes, hurdy gurdies, recorders, viol, curtals, rauschpfeifen, crumhorns, shawms, violin – members of Piva are multi-instrumentalists bringing together the sounds and atmosphere of renaissance Europe. Taking late 16th century dance and ballad tunes, Piva makes them ring out in the 21st century. At festivals, concerts and shows – Piva brings the music of the renaissance to life. The members of Piva – The Renaissance Collective have wide and diverse musical backgrounds and between them they have experience in playing renaissance, classical, and roots music. They bring all of these diverse musical influences together and fuse them with their knowledge of renaissance music and instruments. Eric Moulder is Piva’s founder and director of music. His passion for early music was inspired by the late David Munrow, amongst others. He has been an early woodwind player for many years and has performed with a number of ensembles. He is an internationally renowned maker and researcher in the field of historic woodwind instruments from the Renaissance period and his instruments are played by leading professional musicians and amateurs alike. He also provides many of the instruments played by Piva as well as being responsible for creating many of the group’s musical arrangements. Kate Moran is a versatile musician who is equally at home with classical and folk music. Whilst training at Birmingham Conservatoire and Royal Northern College of Music she spent her weekends playing fiddle in barn dance bands in Northamptonshire! Kate currently plays violin and viola with Boldwood, who specialise in bringing to life rarely-heard tunes from 18th century English dance collections and leads Mouse’s Nest ceilidh band and can often be found guesting with bands both on stage and in the recording studio. Kate is also in demand as a teacher and is the conductor of Manchester Youth String Orchestra. Mary Mohan studied the flute from the age of 8, quickly getting to grade 5 and into the school orchestra. Then she discovered other instruments and nagged her mother for a cello. She was promised a cello if she got a distinction in her grade 5 flute exam, and the rest is history! Mary studied cello, flute, conducting and musicology at the University of Huddersfield and now works as an instrumental teacher and freelance musician teaching a range of instruments. Her biggest influence in recent years has been Jordi Savall, whose recordings have opened up a whole world of Medieval and Renaissance music. She also runs her own group, Archaedium, which specialises in medieval music. Jane Moulder is the resident bookworm of the group and, alongside Eric, she researches and develops Piva’s repertoire and performance programmes. She is a freelance researcher and writer on music, dance and manners of the 14th to 18th Centuries. Jane runs Piper’s Publishing which has produced a number of successful historical music books. She also works for the National Trust as a historical interpreter specialising in the Tudor period. She balances all of these roles with working alongside Eric making historical woodwind instruments. Jude Rees is a professional oboist and woodwind specialist with extensive experience in classical, folk, contemporary and early music. As freelance multi-instrumentalist and sought-after session musician, Jude has worked with some luminaries of the folk world and has guested on numerous albums and live tours. She currently plays with BBC Radio2 Folk Award nominated Pilgrims’ Way and has played for theatre and television including the BBC and the Royal Shakespeare Company. Jude also co-runs a lively early music group for children in Warwickshire.